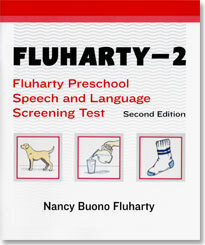 The Fluharty-2 provides rapid identification of those preschool children for whom a complete speech and language evaluation is recommended. 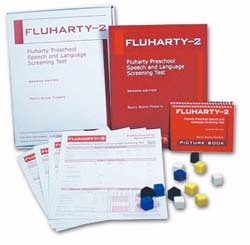 The Fluharty-2 contains five subtests: Articulation, Repeating Sentences, Responding to Directives and Answering Questions, Describing Actions, and Sequencing Events. Scores reflect performance in articulation, receptive language, expressive language, and composite language. The test was normed on 705 children in 21 states. The Fluharty-2 is based on Foster's (1990) model of language development and current child development research. The test is easy to administer (takes just 10 minutes) and is appealing to children. Standard scores and percentiles for subtests and composites are provided. There are also age equivalents for the composites. Space is provided on the record form for noting phonological process errors, voice quality, and fluency. Teacher Questionnaires allow for collaboration when assessing children in school populations.